Many people think that gambling is all about luck. Well, in most cases it is, but there are still some things to think about. 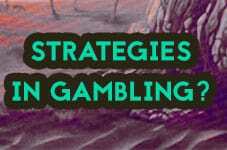 There are many sound strategies that you can implement even in online gambling. And these strategies have the power to turn your luck around. So, what are some of the best strategies to use for online gambling? The first one is to check the RTP rates and the volatility of the individual slots. The higher the RTP rate, the better. There are slots with very low RTP rates and slots with very high RTP rates. It’s always helpful to be reminded that no slot has an RTP rate of 100%. As for the volatility of the slot – different players will have different preferences. The higher the volatility, the bigger the chances that you will hit something. But the chances of making frequent, smaller wins are smaller. So, pick your personal risk preference and run with that. Managing your bankroll is very important. Many people fail to notice this fact. They go and blindly use their money up and keep playing and playing. You need to keep track of your winnings and losses. Moreover, you need to have limits on your betting. If you fail to adhere to any limits, then you may get into serious trouble. Gambling is very addictive and before you know it, you could end up losing all your money. Read more on responsible gambling here. Using the available casino bonuses is also a very important thing to do. Most online casinos have various bonuses at play. If you use them, then you will get to play with bonus money. And you will get to, perhaps, win some money for free. It’s always a nice thing. But you’d be surprised how many people fail to take notice of this opportunity. Just remember, always read the terms and conditions so you know what applies. All in all, these are some of the most important strategies that you could use for online gambling. We hope you will have fun with them, and play safe!